LIGHT. 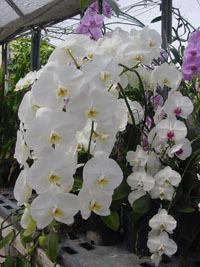 The Phalaenopsis orchids grow well near bright windows, with no direct sun light. An east window is ideal in the home; shaded south or west windows are acceptable. In dull, northern winter climates, a full southern exposure may be required. Artificial lighting is acceptable. Two– or four–tube fixtures are suspended six inches to one foot above the foliage, 12 to 16 hours daily. In a greenhouse, heavy shade must be provided to allow 800 to 1,500 f–c of light. No shadow should be seen if you hold your hand one foot above the leaves. If leaves are hot, reduced light intensity. TEMPERATURE for Phalaenopsis should be above 60° F at night and between 70° and 82° F during the day. Although higher temperatures result in fast leaf and root growth, lower light and good air movement must accompany. Do not exceed the limit of 95° F. Temperatures below 78° F for three to five weeks with good light are needed for initiating flower spikes. Wide fluctuating temperatures and low humidity can cause bud drop on plants with flower buds ready to open. WATER is especially critical for this orchid. The medium should never be allowed to dry out completely. Plants should be thoroughly watered and not watered again until nearly dry, but not until bone dry. In the heat of the summer in a dry climate, this may be every two to three days, whereas during the winter of a northern climate, it may be every ten or more days. Do not allow water to accumulate in the crown for long to avoid contract decaying diseases. Do not sit pots in standing water for long. HUMIDITY is recommended to be between 50% and 80% of relative humidity. If RH is lower than 40% in the home, set plants on trays of gravel, partially filled with water so that pots never sit in water. Grouping plants together can slightly raise the humidity in the immediate surrounding area. In humid climates, such as in a greenhouse, it is imperative that the humid air is moving to prevent fungal or bacterial diseases to set in. FERTILIZER should be applied on a regular schedule, especially if the weather is warm when plants are actively growing. Application of a complete fertilizer, such as Miracle Gro, Peters 20–20–20 or similars, at a rate of half to one teaspoon per one gallon of good quality water at each watering. Reduce this frequency to every other or third watering when it is cool. Make sure that an ample amount of water is applied to allow some excess water to drain from each pot. Water with a high salt concentration should be avoided. POTTING is best done in late spring or early summer after blooming has completed. Phalaenopsis plants must be potted in quick draining mixes, such as fir bark, tree fern fiber, chunky sphagnum peat, charcoal, perlite, or combinations of these. Root rot will occur if plants are allowed to sit in an old, soggy medium. Your young plants should grow fast enough to need repotting yearly and should be potted in a finer grade medium to allow good root contact. Mature plants are potted in a coarser medium may stay in the same pots for years, provided that medium is changed when needed. To repot, remove all old medium from the roots, trim off rotted roots, and spread the remaining roots over a handful of medium in a pot. Fill the rest of the pot with medium, working through the roots, so that the junction of the upper roots and the stem is slightly below the medium. Be careful not to leave large air pockets in pots. Use a stick to push the medium in between the roots. Keep plants in shade and wait for one to three days before watering. NOTE: Each individual bloom lasts 80 to 120 days However, exposure to the fumes and gases from gas stoves, automobiles, and cigarettes can cause all of the flowers and buds to drop prematurely in a few days. Prepared by the Education Committee, the American Orchid Society, 6000 S. Olive Ave., West Palm Beach, FL 33405 and modified by Dr. Yin–Tung Wang, The Texas A&M University System, Dept. of Horticultural Sciences, 2415 East Highway 83, Weslaco, TX 78596 Tel. 956–968–5585. E–mail: yt–wang@tamu.edu. Web site: http://primera.tamu.edu.